It wouldn't be a big event in Monaco unless there was a dose of sartorial confusion, and so it was with National Day. Fruitless though it may be, I have some questions for these kids...forget the awards, let's get some answers. First, the morning events, including the Te Deum. What sort of hat trend are you trying to start, exactly? What's up with the pleated ruffle thingies? The eternal question for Mr. Lagerfeld, really. Kudos to Caroline for looking dignified anyway. Why are you wearing a scrunchie? Totally negates the rest of the outfit, which is probably the best thing she's worn in quite some time. Why is your hat so fabulous? Nonchalant glamour at its best. 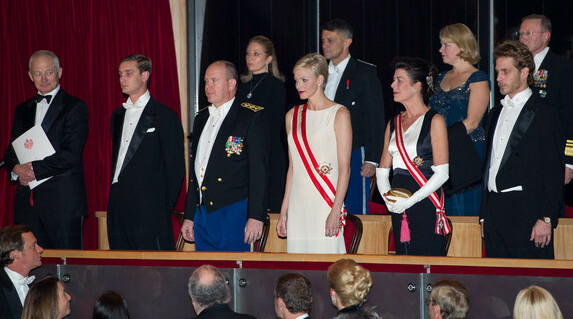 I don't know why the reigning Prince of Liechtenstein was a (seeming) guest of honor for the day. Reigning princes gotta stick together? And then, the evening gala. Why'd you take your coat thing off? That's where all the fabulous was, I'm just saying. I mean, leave the gloves on at least. Hard to go wrong when opera gloves are involved. Why don't you just wear tiaras already? Seriously, the dress code's been upped to include sashes since Charlene just had hers awarded (sub question: why is she wearing the wider male version? ), and Caroline has jewels in her hair anyway. So. Close. I have so many more questions (Andrea, are you grooming yourself in the wild again?) but eh, you know what, I withdraw them all. This is Monaco - just when you think you've got it figured out, they'll prove you wrong. Any sartorial highlights here for you?